With such an astounding number of exciting tourist attractions surrounding the Villages of Citrus Hills, our residents are always finding new adventures all around them. One easy activity that just about everyone will enjoy is visiting some of the outstanding wineries of the region. 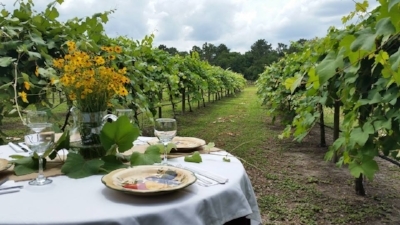 Whether you see yourself as an amateur sommelier, or you are looking to up your wine knowledge, or just looking for something fun to do on a Saturday afternoon, these wineries in and around Citrus County offer the perfect atmosphere to enjoy a wide range of excellent local products. Located right down the road in Crystal River, Copp Winery is one of the friendliest and inviting winery atmospheres you will find anywhere. They do an excellent job of putting novice wine drinkers at ease with their three tasting rules: relax, enjoy, and don't worry. Copp Winery produces a wide range of wines that includes the most common varietals, but they also specialize in creating some unique blends and sweet wines. There are plenty of options to try by the glass at their wine bar, and they also sell bottles and cases to take with you. They also micro brew ales. If you are having a few glasses in the wine bar, you might also want to plan on ordering the Cheese Sampler Plate or the Bruschetta Pomodoro from their Snack Bar menu. Both are excellent. You won't find any traditional choices on the wine list at Whispering Oaks Winery. That's because they make all of their wines from locally grown and freshly harvested blueberries. Located just a bit east in Sumter County, Whispering Oaks is doing some amazing things with one of the hottest new trends in the world of wine. They also serve fantastic flatbreads that can be paired up with whatever blueberry wine you decide is right for the moment. And if you are planning an evening trip to Whispering Oaks, you should make a reservation for one of their steak nights that includes a fantastic steak dinner on the stunning patio next to the wood grill and koi pond. With more than 200 acres of vineyards under contract across the state of Florida, Lakeridge Winery in Clermont is one of the largest and most impressive wineries in the entire state. But that doesn't stop them from paying particular attention to every single bottle they produce, as well as every single customer that walks through their doors. The wine offerings include many of the standards like Cabernet Sauvignon and Chardonnay, but we recommend tasting their Chablis, which is a blend of Florida Muscadine grapes. The winery has tours every day of the week, and they also have a great retail area where you can purchase all kinds of gift items along with their wines. While visiting a winery always sounds like an excellent idea for wine drinkers, you might have a hard time convincing your beer drinking friends to tag along. That won't be a problem if you are heading to Barnyard Barn Winery because they also brew their own small-batch beers with the same level of craftsmanship that they put into their wines. This is an excellent place to visit if you are planning to spend some time in the tasting room. And make sure that you check their website for upcoming events because they regularly host live music nights. Located in downtown Ocala, Katya Vineyards offers another excellent selection of local wines to choose from. In addition to their own wines, they also carry a number of carefully chosen imported wines and craft beers in their tasting room. Be sure to try their flagship white blend. Katya Vineyards also offers a Wine Club program where you can have their wines shipped right to your door at whatever schedule works best for you!